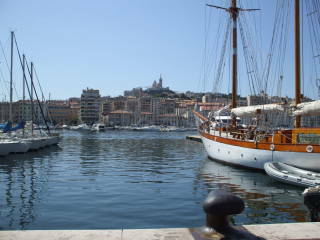 You might arrive in Marseille in the traditional way, in a small boat. These days, however, you are much more likely to arrive in Marseille by train. 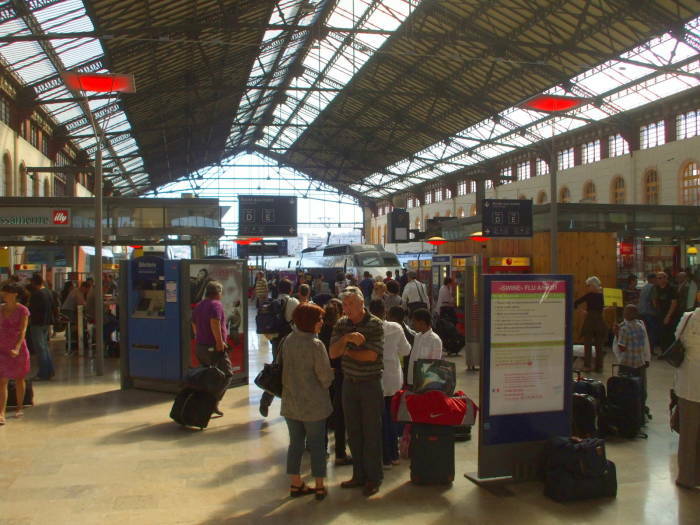 Gare Marseille Saint-Charles is the main train station. 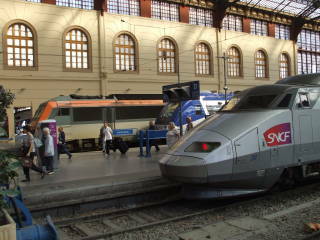 In foreground of this picture we see the TGV, the high-speed trains running at 300 kilometers per hour throughout France. The TGV joins Marseille to Paris in just three hours. 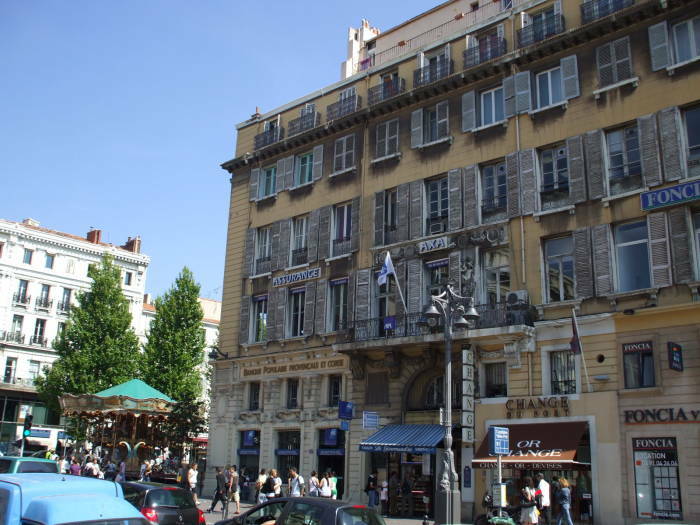 There are direct TGV lines from Marseille to Lilles in northeastern France and onward to Brussels, to Strasbourg and to Genève. 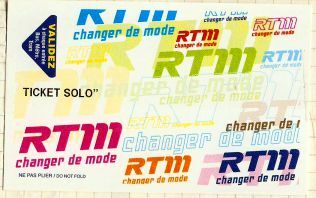 Regional trains like those in the background below connect to nearby Aix-en-Provence, Arles, Avignon, and beyond. A regional train east through Nice connects to Italian trains at the border, following the Italian coast to the south and beyond. 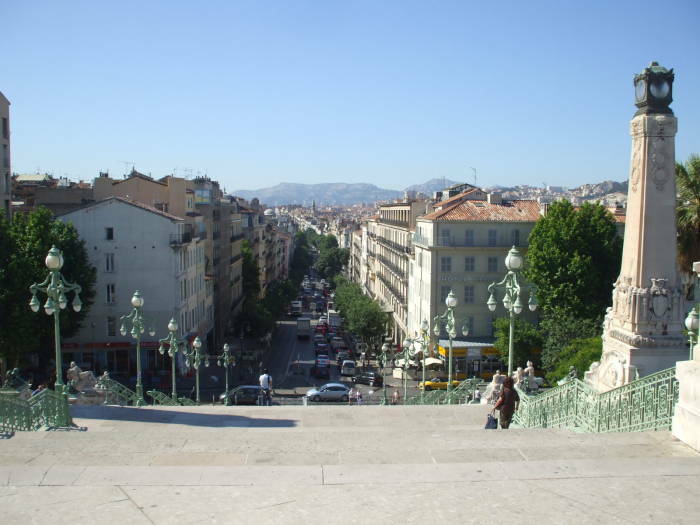 If you are arriving in Marseille from outside France, then it is probably by air to Marseille's international airport. In that case, a frequent bus runs from the airport to Gare Saint-Michel every 20 minutes, taking 25 minutes to make the trip. The airport bus uses the modern inter-city bus station in the north wing of the train station, out of view to our left in the view above. 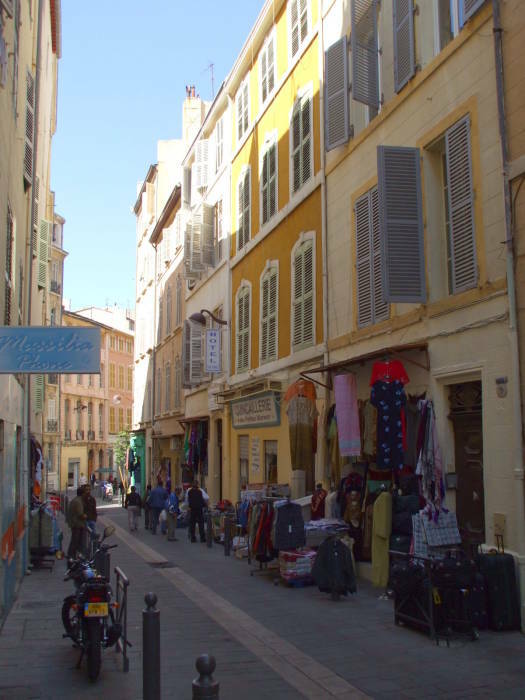 Nearby cities like Aix-en-Provence are an easy day trip from Marseille. 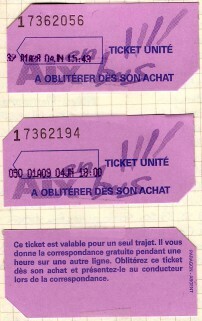 Ticket for the Régie des Transports de Marseille airport bus. Poster for the Marseille 1906 Exposition Coloniale. 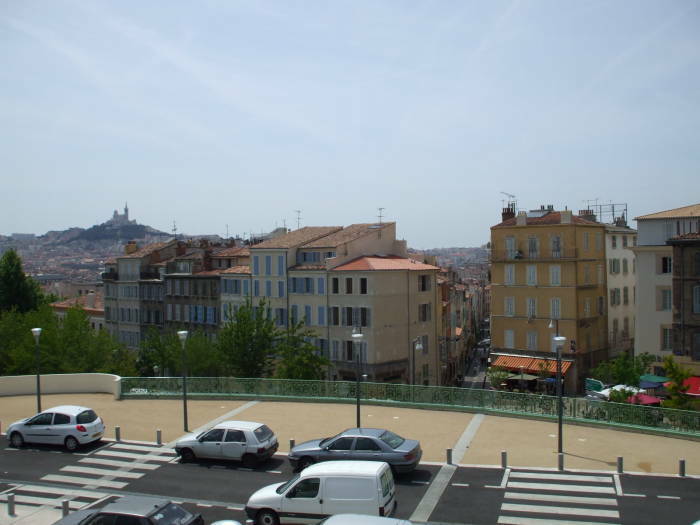 You still might arrive by ship, Marseille is a busy ferry port. We'll see the ferry port soon. 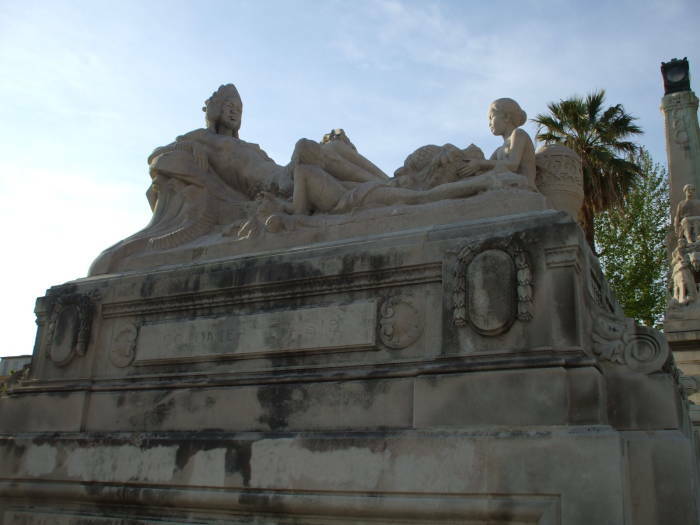 Marseille has been a busy port of entry and exit for France, especially during the greatest extent of the French Empire. The North African French colonies of Tunisia, Algeria and Morocco are directly across the Mediterranean, and Corsica is on the way there. 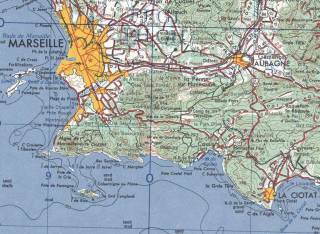 Other French territory down through central Africa could be reached by ships from Marseille leaving the Mediterranean through the Strait of Gibraltar. The French Caribbean islands and colonial territory on the northern coast of South America were on across the Atlantic. 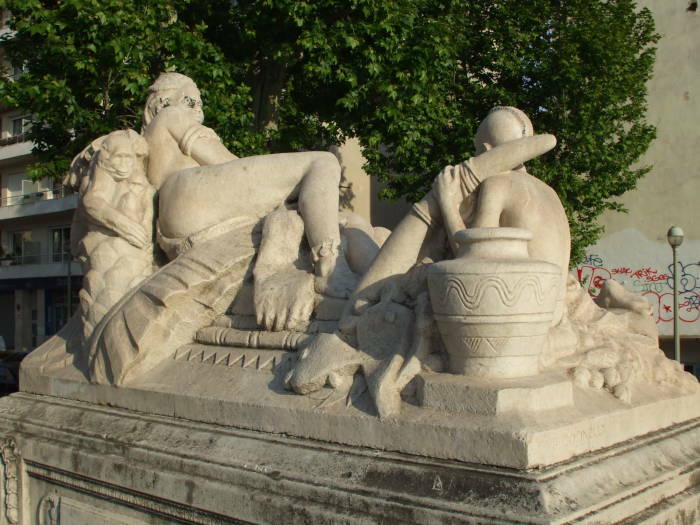 Even earlier, French North America was also reached from the port of Marseille. Once the Suez Canal opened in 1869, the voyage to French Indochina was a little less long. 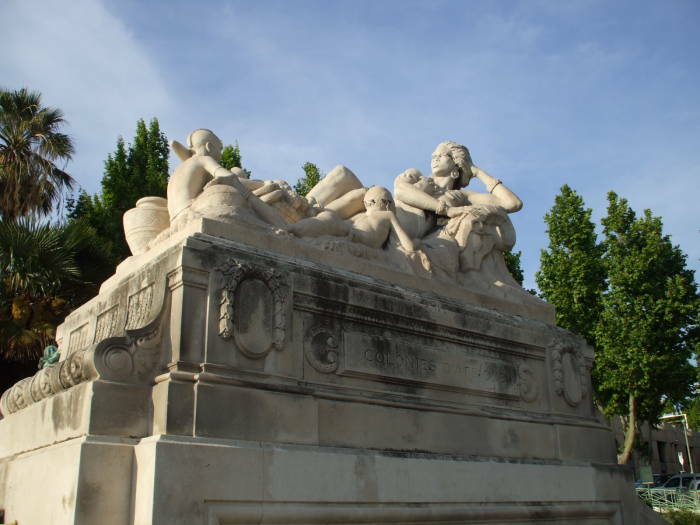 Colonial expositions in the early 1900s celebrated the diverse French Empire. 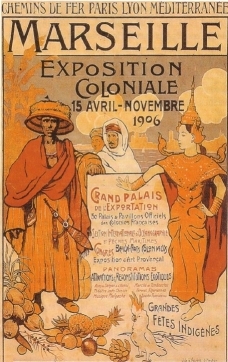 The poster seen above promises that the 1906 exposition will include 50 official display areas of French colonies, an international section for oceanography and maritime fishing, and panoramas with exotic attractions and reconstructions including the streets of Saigon, an Indochinese theater, Malagasy music, dancers from Timbuktu, Algerian produce and Tunisian souks. You can see from the poster that the exposition was promoted by Chemins de Fer Paris Lyon Mediterranée. That is, the Paris-Lyon-Mediterranean Railway, the primary early 1900s link from Paris to this port. Let's head out into the city! In the first picture we're looking off the balcony running across the front of the train station. On the skyline to the left we see Basilique Notre Dame de la Garde, the symbol of Marseille, a dramatic cathedral overlooking the city from its highest point. 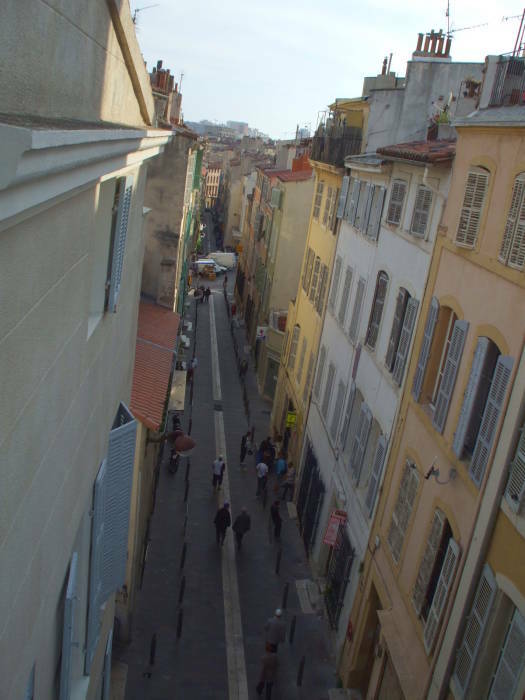 The narrow street running nearly straight away from us just to the right of center is the Rue des Petites Maries. It runs straight toward the Old Port from here. We'll go down that way in a bit, but first let's turn to our left and go to the south corner of the station. 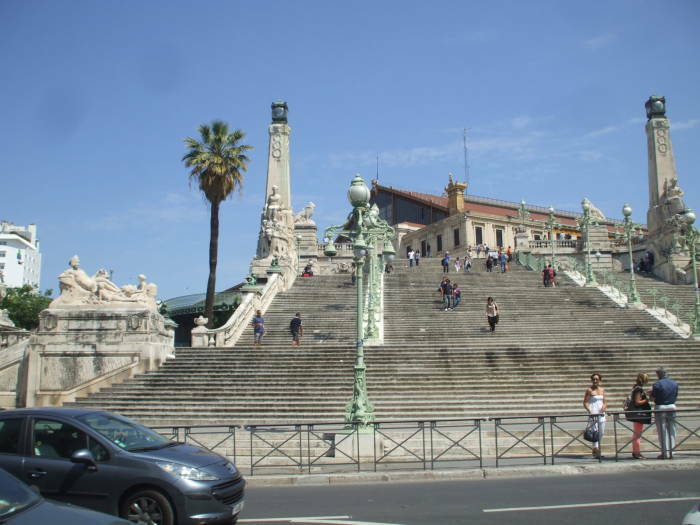 A grand staircase leads down from the south corner of Gare Saint-Charles to Boulevard d'Athènes, a major street running north-south. This street changes its name every few blocks, from Boulevard d'Athènes to Boulevard Dugommier, then to Boulevard Garibaldi, and then to Cours Lieutaud. The staircase is flanked by allegorical statues representing parts of the large French Empire of the early 1900s. These represent the French colonies in Asia. These represent the colonies in Africa. They're allegorical, things probably weren't so languid in the colonies. We've reached the end of Boulevard d'Athènes and turned to look back up at Gare Saint-Charles. 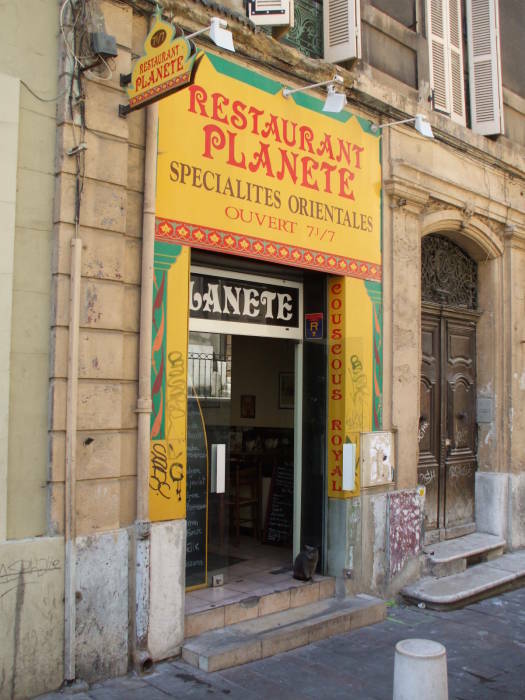 We will turn back around and go down the hill along Boulevard d'Athènes toward La Canebière, Marseille's main thoroughfare. Boulevard d'Athènes changes its name to Boulevard Dugommier by the time we get a little over half-way there. The nation of Yugoslavia was formed in 1918 by merging a number of small states and kingdoms with some territories of the Austro-Hungarian Empire. Aleksandar I Karađorđević was the son of King Peter I of Serbia and the former Princess Zorka of Montenegro, he was made King Alexander I of Yugoslavia. On 9 October 1934, Alexander arrived in Marseille for a state visit to the French Third Republic and meetings with the French foreign minister Louis Barthou. Vlado Chernozemski, a Bulgarian and a member of the Macedonian Revolutionary Organization, shot the king and his chauffeur as the state procession passed the base of this staircase. This was one of the first assassinations captured on film as Chernozemski happened to be standing very close to a newsreel cameraman. A mounted policeman slashed Chernozemski with his sword, and then the crowd beat him to death. Providing an example for future conspiracy theories, the newsreel did not capture the precise moment of the assassination. But it was manipulated to give that impression, with three identical gunshot sounds added to the film afterward. 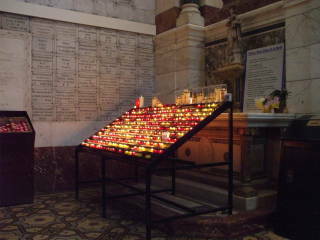 Chernozemski really shot over ten rounds, killing or wounding a total of fifteen people. 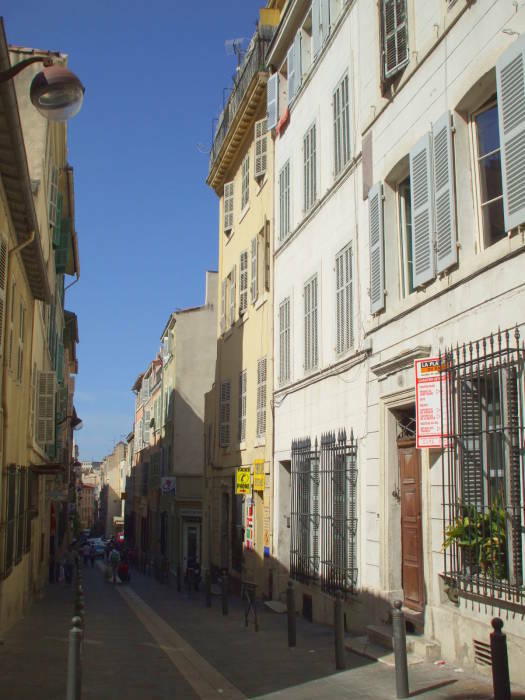 La Canebière is a broad avenue leading from a central quarter to the port. Its name is the Provençal word for cannibis. That doesn't mean that all the head shops are located along this boulevard. It used to be lined with makers and sellers of hemp rope supplying the ships docked in the old port at its end. The inland end of La Canebière is in the Réformés district, named for a "Reformed" Augustine convent that was once here. L'église Saint-Vincent de Paul is better known by the name l'Église des Réformés. 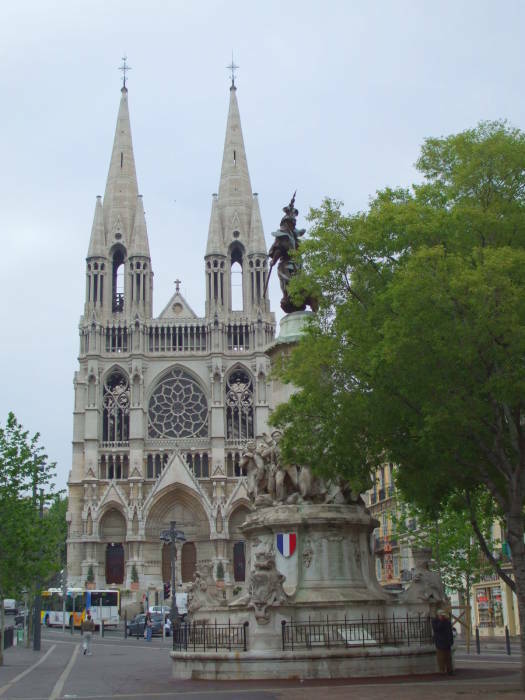 The cathedral was built in the 1850s, but its design is based on the Gothic style of the 13th Century. 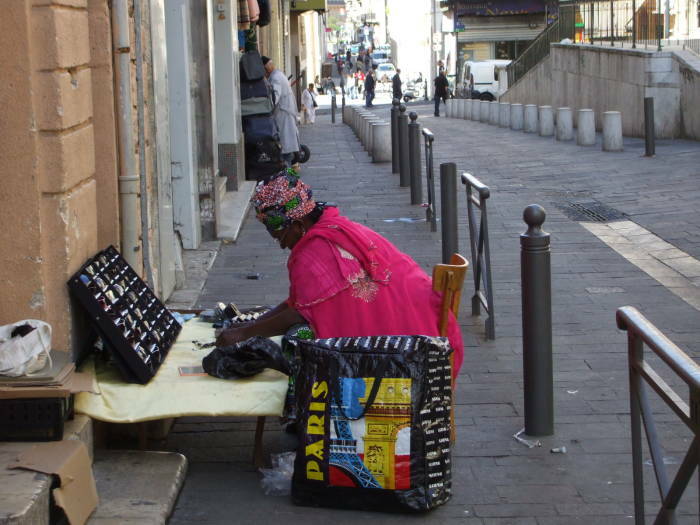 As we start down La Canebière we pass another street vendor from Africa. 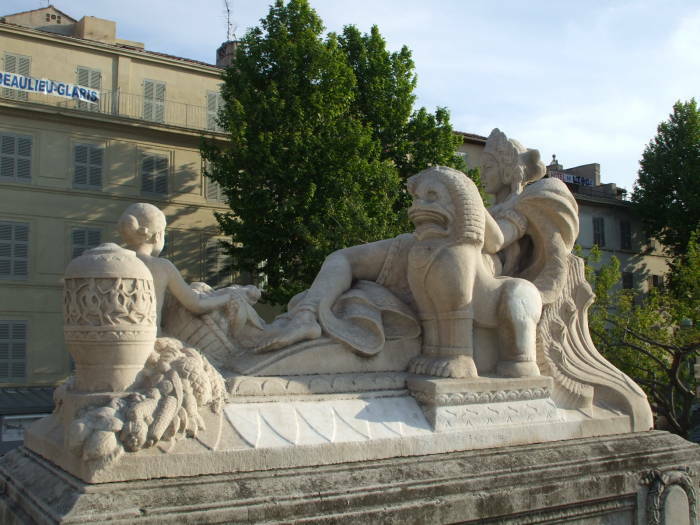 In the background are signs of the southeast Asian parts of the former French empire. La Canebière is lined by large businesses that have replaced all the rope shops. There are many large banks. The main shopping district is just two to three blocks from the harbor. A tram line runs through the broad pedestrian-only plaza of that shopping district and turns to run east along La Canebière through Réformés. Let's go back and drop off our bag. 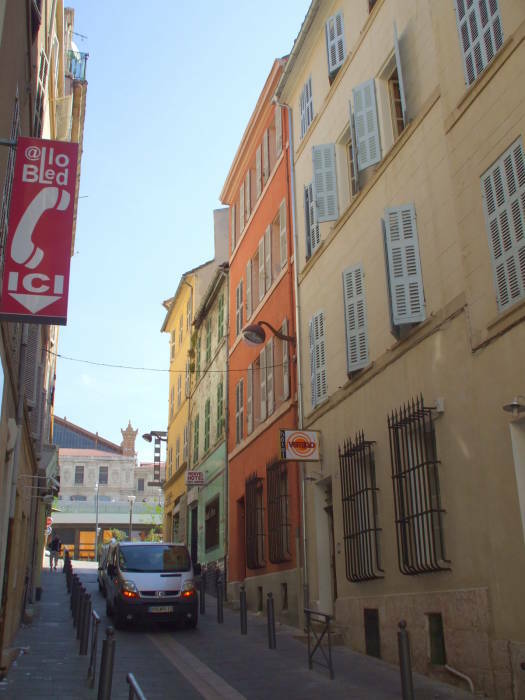 The Vertigo hostel is just across the road from Gare Marseille Saint-Charles, in the first block down the narrow Rue des Petites Maries. 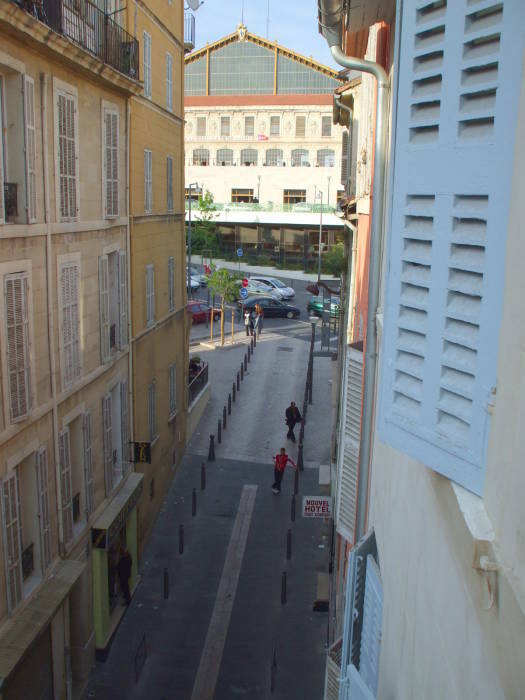 It's the yellow building at the right, up the street we're looking at the front of Gare Saint-Charles. This is a nice place to stay, I have stayed here a couple of times. They have a mix of private and shared rooms. The Vertigo certainly has a convenient location! Looking out the window of my room we see the front of Gare Saint-Charles at the end of the block and across the busy street. 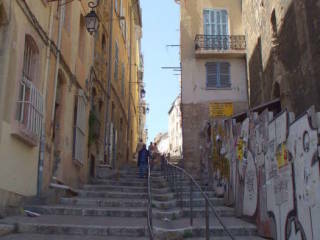 The opposite direction leads down the hill along Rue des Petites Maries toward the old port. You can't quite see the water from here, but the hill in the distance is on the diagonally opposite side of the harbor. 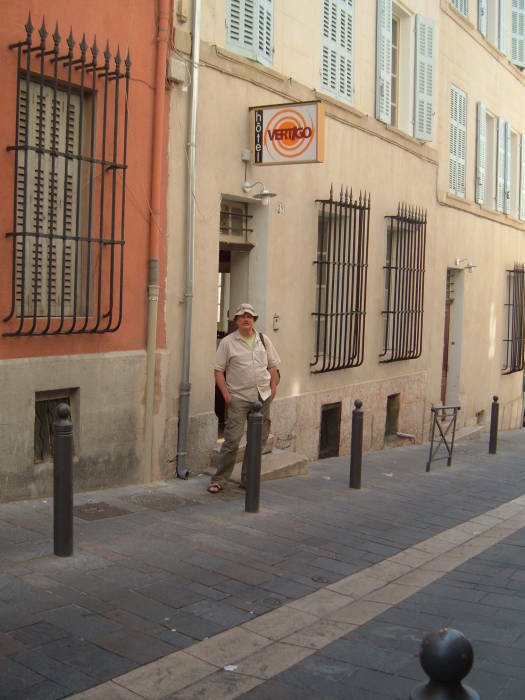 There are a few other small reasonably priced hotels at the top end of Rue des Petites Maries. The street is also lined with telephone shops. They sell local SIM cards and also have calling booths. You can easily and cheaply place calls to anywhere in the world from the private booths, paying at the counter when you are finished. We could go up to the station and take the subway down to the Old Port. You see some subway tickets here. But let's walk on down Rue des Petites Maries. The back streets are lined with small shops selling a wide range of everyday goods. Or maybe not so everyday, if you aren't from a cosmopolitan place like Marseille. 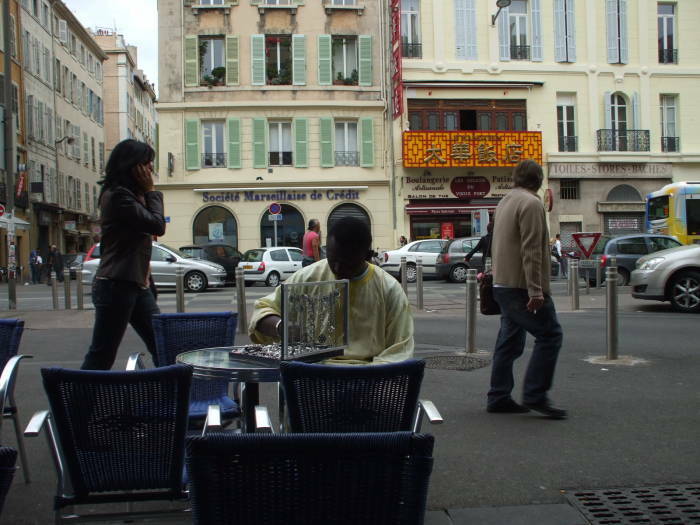 You have to go to İstanbul to find Marseille's mix of people and the density of capitalism per square foot. 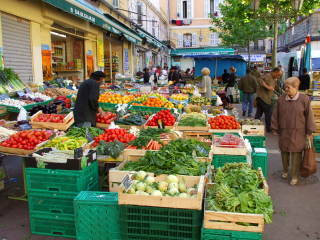 Speaking of densely packed international capitalism, let's visit the markets in the blocks south of La Canebière.